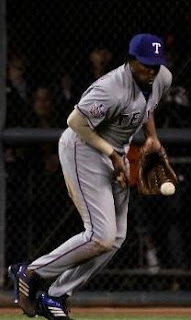 In what was a rough night for most Rangers, Vlad Guerrero butchered right field like the no-kneed, no-backed 35-year-old that he is. Don't get me wrong, I still love Vladdy even though he defected from my beloved Halos to the division rival Rangers but that man has no business picking up a glove anymore. 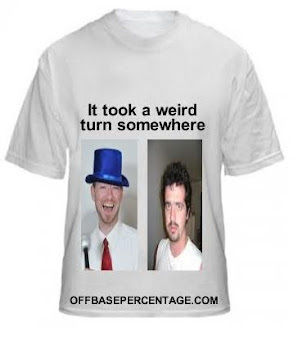 And everybody but Vlad and Ron Washington knows it. Vlad served as the Rangers' DH for most of the season and would be better equipped coming off the bench to pinch hit instead of roaming triples alley in San Francisco like a deer that was just hit by an 18-wheeler. Both recorded errors came in the 8th inning when he whiffed on a ball hit by Edgar Renteria that rolled to the wall and juggled a ball hit by Freddy Sanchez in the Rangers' bullpen. It was the equivalent of watching an octogenarian try to use a cell phone, lots of confusion and inevitable errors. Guerrero didn't look all that great when not making errors either. I think we all know who's to blame for Vlad's steep decline in fielding and general walking around ability. That's right, the Montreal Expos. They really should have sprung for some turf in that stadium instead of just spray painting the concrete green. The simple and obvious answer for the Rangers is to plug David Murphy into the outfield rotation and sit Vlad when they play in San Fran, especially against righties. Murphy hit .294/.364/.472 against right handers this season compared to Vlad's .287/.328/.432 line against northpaws. They face another one tonight in Matt Cain. I expect Washington to make the smart move here and switch them out because I'm delusional and assume that the Rangers' skipper reads this blog. Random Vlad Guerrero story. I had an ex-girlfriend who used to watch 100+ Angels games per season with me and she bought me an authentic Vlad jersey for my birthday. She got it off of Ebay but had no idea how sizes work. So now I have a size 60 jersey that I could use as a blanket. I don't think 6'5 Vlad could even wear it.